An SUV jumped a curb in Arlington, Virginia, Tuesday afternoon, injuring two women on a sidewalk. The pedestrians were hit on the 3100 block of Clarendon Boulevard about 3:15 p.m., Arlington police said. A woman using an ATM was trapped under the SUV, police said. She was rushed to George Washington University Hospital with serious injuries. The other woman was hurt less seriously. She was taken to Virginia Hospital Center. Both women are expected to survive. The crash occurred outside Mad Rose Tavern, near where Clarendon Boulevard, Washington Boulevard, Wilson Boulevard and N. Irving Street intersect, west of the Clarendon Metro station. 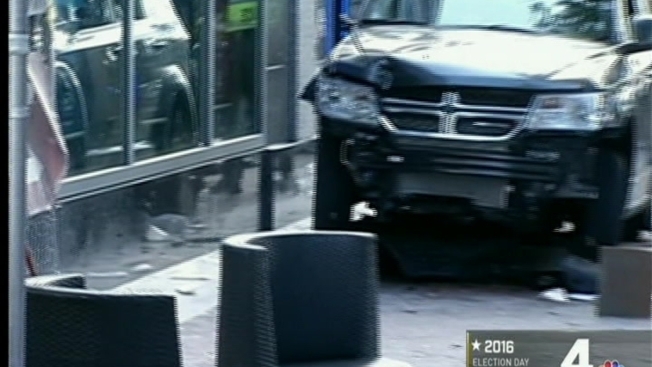 The driver, a man, remained on the scene and was being interviewed by police. Information on why he jumped the curb was not available immediately. No charges had been filed against him as of Tuesday night. Mad Rose Tavern was closed Tuesday night. Workers there were said to be shaken by the crash.